A glorious reunion with three Smiths, two tin dogs, and genetically modified gargoyles who are allergic to their own oil. 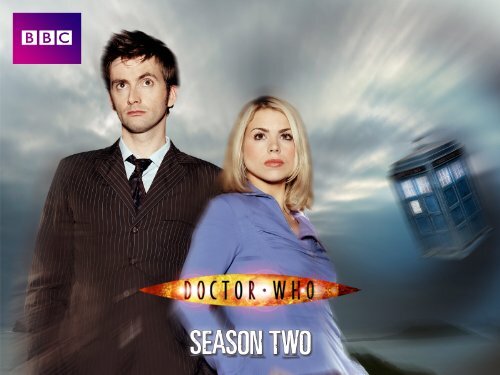 The 10th Doctor and Rose are undercover in Deffry Vale High School after Mickey, aka Ricky, has (not booty-)called Rose to say that there’s something pretty alien going on. And he’s not wrong. The Krillitane Brother Lassar, portrayed by Anthony Stewart Head (Giles in Buffy the Vampire Slayer), is himself undercover as the headmaster, Lucas Finch, along with the rest of his genetically modified gargoyle brethren who in turn make up the rest of the faculty. When they’re not eating orphans (! ), they’re using potato chips to turn the rest of the kids into computer chips. Clever, eh? Support the show by using our Amazon link to buy this episode. Not only do you get a spiffing addition to your Doctor Who collection, but Who Back When gets a commission that'll go towards keeping the lights on and the microphones hot. Coming to this review very late, but I wanted to ask you guys why you think Micky-Ricky was assuming the Doctor and Rose were a couple when he says, “The missus and the ex.” He’s making a joke about having an old companion and a new companion come face-to-face with a little animosity in the air. That’s all. He’s not being literal. I can’t imagine how that went over your heads. Look back to Series 2 to see where Moffat got all his ideas! Last week it was Rose pulling up Doc for being rude, whereafter they got stuck in a library; this week it’s Doc teaching physics while his companion serves chips. Next thing you know he’ll not be wanting to leave after a final battle against John Simm. The basic concept is extremely appealing: nefarious staffroom goings-on at a school where the teachers exploit the children for mysterious evil ends. So why isn’t the atmosphere as good as last week’s? There are many naff bits: kids coding is apparently terrifying. School explodes why? Kenny’s clearly the hero how? The Krillitane are alternately lethal destroyers and risible flappers, Rose rolling around on the floor apparently defence enough. But when SJ and Rose finally bond it’s splendid. Sarah-Jane actually acts well here, cf. later. Noel Clarke too has never been, and perhaps never will be, better. Giles’ impression of Donald Trump Jr is spot-on and his oily temptation of the Doc generates genuine dramatic tension. Rose and Doc are good too, their continued character development more likable this week. 1) Ponken, you liked John Simm as well, you thought he was great? 2) In the Australian K9 spinoff, references to Doctor Who are specifically not allowed because it’s non-BBC. How likely do you think it is the announced K9 movie showdown with Omega will still hit cinemas in 2017? 3) I was aware of K9 growing up without any knowledge of Doctor Who itself. He’s simply iconic. 4) The 50th century is *when* Captain Jack is from, not *where*. Can’t believe you missed that, you absolute freaking idiots. I’d lambast you categorically over matters of interpretation in the most condescending manner possible but the previous reviewer already beat me to it. I’ll have to listen back to this review. It’s been quite a while since we recorded it. In fact, it’s high time I revisit some of these episodes from before we switched to a more freeform chat on the show, instead of the plot-point-by-plot-point approach we had at the time. Anyway, that’s mainly to clarify that I honestly don’t recall exactly what I said at the time. I’m already queuing outside of the multiplex. Hehe. Well, you can’t please everyone.